Status: Mostly demolished, remainder derelict, with admin, chapel, wards, isolation hospital, orangery and annexe remaining. From the 1845 County Asylums Act onward, where the building of an asylum had been mandatory, those living in what is now Kesteven fell under the remit of Lincolnshire, and so any pauper lunatics seen to be in need of custody would have found themselves at The Lawn at Lincoln (1820), and later the Lincolnshire, Grantham and South Holland County Asylum (St John’s Hospital) at Bracebridge Heath (1852). In 1889, Kesteven became its own county authority, and therefore needed provision of its own. These earlier institutions were becoming overcrowded and no longer able to take those from outside the county, so the Lunacy Commissioners urged the Kesteven authorities to begin the process of building their own at haste. They would do this in conjunction with the Grantham authorities, who had always had a strained relationship with those of Lincolnshire and were already keen to break away. The first meeting of the joint authorities was held on January 31st 1894, with sixteen different sites being considered. A site at Barrowby was felt to be most suitable, but the land at Quarrington Glebe near Rauceby was cheaper, and thus the asylum’s location was decided. However, both the Lunacy Commissioners and the Grantham authorities opposed the choice of site, with Grantham eventually backing out altogether before work had even begun. The Kesteven authorities were still very happy with their new site, which along with being cheap also included an ample 112 acres, included a well from which to draw clean water, good drainage, and was within 100 yards of both the railway line and main road between Grantham and Sleaford. 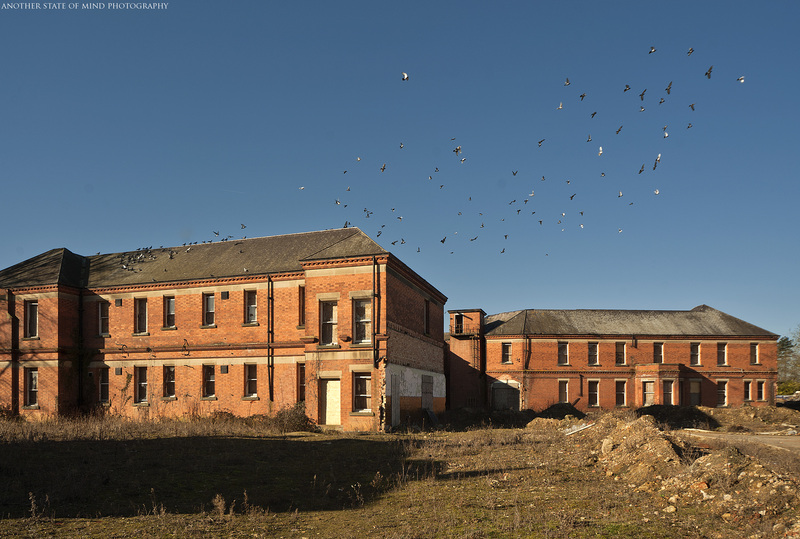 The Kesteven authorities were aware that it would still be years before the new asylum was ready, and so they rented the derelict former Grantham workhouse, which then stood on ground known as Triggs Yard, belonging to the Great Northern Railway. It was scheduled for demolition, to be replaced by a new goods yard, but despite its grim and by then very much out-of-date 18th Century design, the Kesteven authorities treated it as if it was a proper asylum, refurbishing it and fitting it out with all that was required. They also appointed their first Medical Superintendent, Dr John Alfred Ewan, formerly of the Dorset County Asylum (Herrison Hospital). The new “asylum” opened on 27th January 1887, receiving 23 patients back from Lincolnshire, but was already at its full capacity of 111 and being extended just one year later. There are no records of mechanical restraint having been used at either the converted workhouse site or Rauceby when it was finally completed, which may possibly be related to the legacy of Lincoln’s The Lawn – the first public asylum in the UK to abolish such practices entirely. Five different architects were asked by the Kesteven authorities to submit designs, which included J. Vickers-Edwards, architect of the 2nd and 3rd West Riding Asylums (High Royds and Storthes Hall), as well as Giles, Gough & Trollope, whose other work included the Brecon & Radnorshire Asylum (Talgarth) and the Somerset County Asylum (Tone Vale). They settled on the design submitted by George T. Hine, Britain’s most prolific asylum designer, whose plans were used for a total of 14 UK asylums, along with additions and extensions to several others. Although not the originator of the design, Hine is generally felt to have perfected the “echelon” or “compact arrow” plan, which was first used in its true form for his immense London County Asylum at Claybury in 1893. This in itself was felt to be the zenith of almost a century of asylum design which had preceded it, and after constant iteration and experimentation, finally brought all the complex considerations around the separation of types of patient, inclusion of the various services, utility and access, cost-effectiveness, integration of air and sunlight, safety and security and movement between areas for patients and staff etc. which had confounded asylum designers since the first non-linear forms began to appear in the 1810’s. The echelon plan saw the wards arranged in a staggered form behind one another, but gradually progressing outward from the administrative centre in order to ensure no ward stood in front of any other, thereby maximising sunlight, air and views for all patients throughout the day. 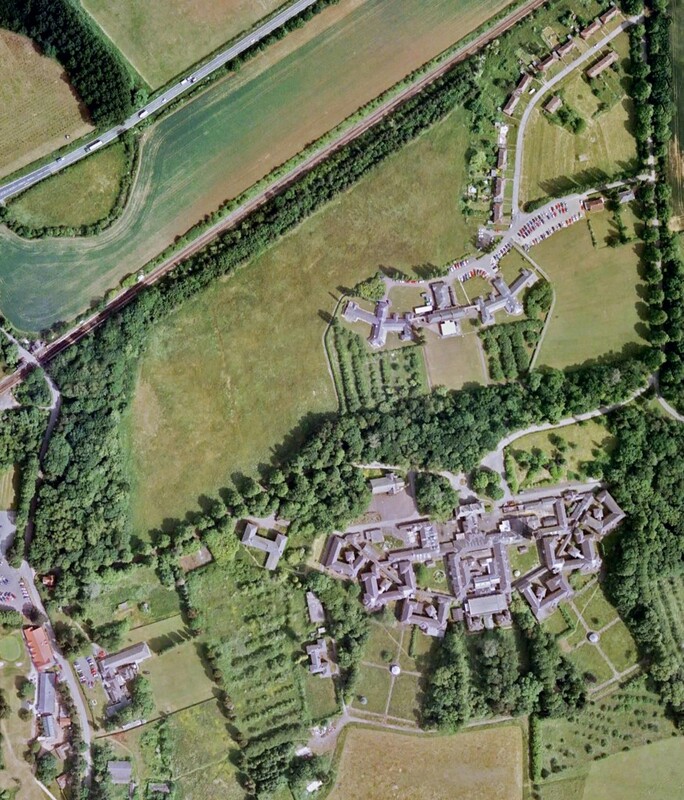 Unlike Claybury, which was made up of detached ward blocks linked by external corridors, Rauceby was a “part-continuous” echelon plan, with four of the six ward blocks linked to each other. This created an almost continuous south-facing range of wards, with the corridors skirting the inner edge of the overall horse-shoe shaped design of the building as a whole, rather than linking separate wards as in earlier “detached” echelon layouts. Hine used this “continuous” echelon plan (with no gaps between wards) at all but one of his asylums from the 1895 Sunderland Borough Asylum (Cherry Knowle) onwards, and Rauceby was perhaps the finest example of it being used on a much smaller scale than that of the huge 2000+ occupancy asylums he designed for London. 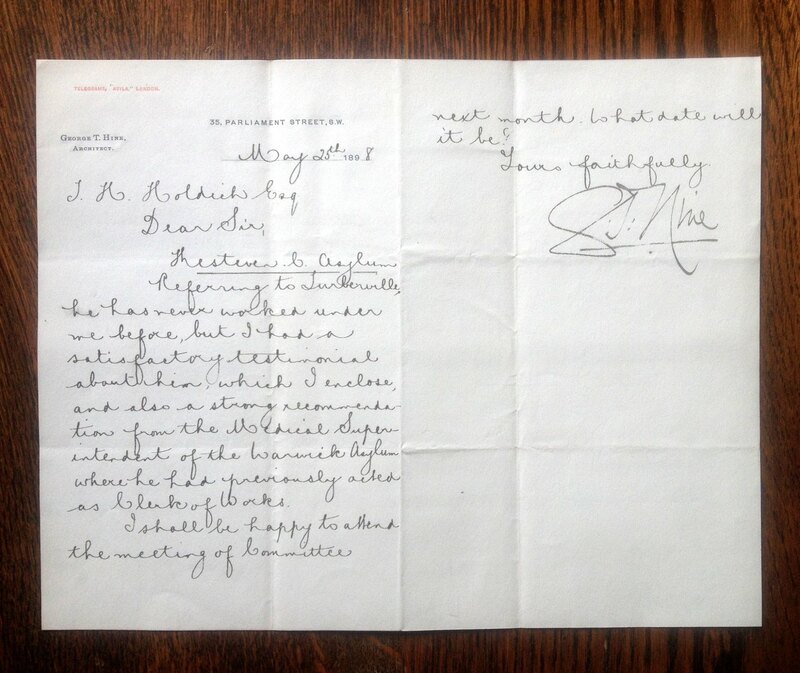 Below: Reference letter from GT Hine to the Kesteven Committee regarding the Clerk of Works. The main building was of simple red brick with minimal polychrome brick decorations and Darley Dale stone dressings – while Hine was very much capable of coming up with attractive and ornate buildings such as those at Claybury, Netherne and Long Grove, he also came up with some of the most austere and plainly functional asylum buildings too, and Rauceby tended toward the latter. This was down to very specific requests from the Kesteven authorites, and Hine’s messages to them mention that he had deliberately cut down on building costs with the reduction of decorative aspects at their request, while he was keen to point out that no expense had been spared nor corners cut in relation to “utility or structural stability”. The chapel and water tower are very plain, with minimal Ancaster stone decoration to the chapel, which is also of a traditional design and layout, unlike Hine’s more quirky and modern designs for Bexley and Horton. The 100ft water tower and adjoining chimney are only distinguished by a modest crenellation at the top. Even the usually more elaborate admin block sports just a little Ancaster stone decoration, Vermont Green slate and a modest, but attractive clock-tower. However, it is still a very handsome and nicely-proportioned building, and as usual Hine went to town on the interior with his trademark polychrome glazed brickwork, elaborate tiling and Italian mosaic flooring. All the wards were originally pine-panelled, with Hine’s signature toffee-coloured glazed bricks adorning all the corridors, stairs and many other areas up to waist level. Fire-proof ceilings and floors were provided by Stuart’s Granolithic Company, and the most up-to-date plumbing provided by Doulton & Co. The male wards were named after different types of trees, and the female wards after flowers. 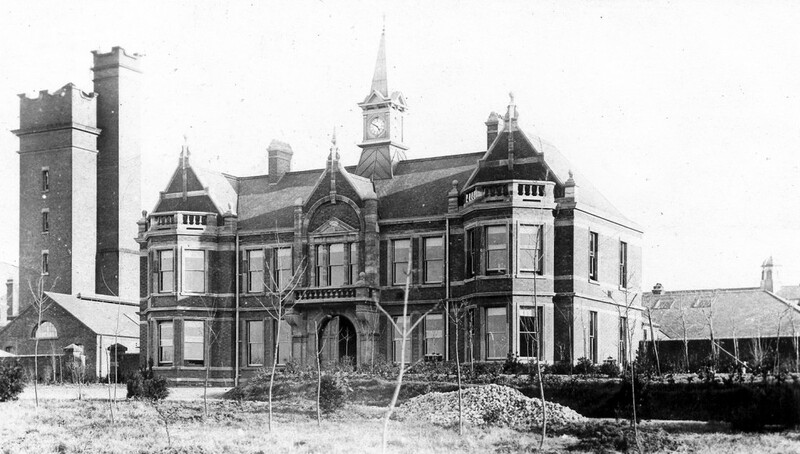 The new Kesteven County Asylum was opened on 20th June 1902 to its first batch of patients transferred by train from the workhouse at Grantham. Dr Ewan also transferred to Rauceby and continued his post as the first Medical Superintendent. As with all County Asylums, Rauceby was intended to be as self-sufficient and self-contained as possible, with its own recreation hall, workshops, carpenters, engineers, cobbler, tailor, bakery, airing courts, mortuary, surgery, opticians, dentist, darkroom, laundry, blacksmiths, chapel and farms. The gardens and grounds were designed separately, with Robert Lloyd, gardener at the Surrey County Asylum (Brookwood) initially approached to submit plans. However, due to ill health, Lloyd had to pull out, and the Kesteven authorities instead employed William Goldring, esteemed designer from Kew Gardens, and Assistant Editor of the Royal Horticultural Society magazine “The Garden” instead. This noted landscape-gardener, with over 700 works to his name in England alone (as well as many others in Wales, Scotland, the USA and India) cost four times the price paid to Lloyd. In the early days, from 1902 through to the 1930’s, staff at Rauceby worked 14hr shifts from 6am until 8pm, before handing over to the reduced night staff who covered the remaining hours. They had one half-day off per week, and every third Sunday could also be taken off. Even on their days off they had to be back at the asylum by 10pm (on pain of instant dismissal) to be locked back on the ward for the night along with the patients, albeit in their own rooms. Female staff would have to leave their job at the asylum if they wanted to get married, while male staff did have the option to marry but had to have formal permission from the Superintendent in advance. Records at Rauceby do indeed show one staff member having been sacked for getting married without seeking permission. Both male and female staff had to request the permission of the Superintendent if they wished to even apply for a job anywhere else. The farm was extended by 70 acres in 1913 in anticipation of growing patient numbers, and one of Rauceby’s most notable elements was added the following year – a cast-iron orangery, was cleverly incorporated into the gap formed between the southern-most male and female ward blocks – this was added in July 1914. However, both proved fortuitous as the extra land and space to grow helped mitigate some of the shortages that would come with the outbreak of the First World War the following year. During both world wars, many asylums were cleared out for military use, with the patients either discharged or crammed into those asylums which remained in their original role. Rauceby was one that remained, and saw such overcrowding that every ward was filled with beds end-to-end, while even corridor space was given over to being lined with beds – including some of the corridors in the basements. With most of the male staff enlisted in the war effort and Dr Ewan now the only remaining qualified staff member in the whole asylum, there was no choice but to allow senior female staff, who had previously been banned from even entering the male wards, to take up work across the asylum in order to direct the work of the other, often inexperienced new staff. Besides a German zeppelin dropping a bomb in a nearby field, Rauceby otherwise passed the First World War unscathed. Dr Ewan retired in 1922, which coincided with the institution changing its name to Kesteven Mental Hospital. Unusually, there was no immediate replacement lined-up, but he was finally superseded by Dr Iain McPhail in 1923, himself replaced by Dr Normal Henderson, previously of the Lincolnshire County Asylum at Bracebridge Heath (St John’s) in 1929. The other big event of 1929 was the modification of the wireless system in the recreation hall to allow the playing and amplification of gramophone records, and with the Mental Treatment Act of 1930, it was also the last year that the patients could be formally referred to as “pauper lunatics”. An isolation hospital had been built in 1919 in anticipation of the asylum being hit by the influenza epidemic that swept Europe at that time, killing millions. As it happened, and probably largely due to its isolation, Rauceby had no issues with this, and the hospital was never used for its intended purpose. So by 1924, it was used to house those patients who worked on the asylum farm, thereby freeing up a little space in the main building. Rauceby was built for 460 patients and in 1930 had a total of 464, but only around half of these were actually from Kesteven, with 221 coming from Peterborough, Grantham and even as far away as Essex. A programme of improvements began in the 1930’s, with all the dirt roads being tarmacked, the prison-like airing court railings being replaced instead with thick shrubbery, refurbishment of the bakery, kitchens and laundry, and a graveyard being arranged for those patients who died at the asylum and were not claimed by relatives. A nurses home and admission hospital were also built. Unlike the previous war, Rauceby would give up its usual role to play a rather different one in World War 2. Lincolnshire in general, with its large open spaces and flat fields would play an important role in the coming aerial warfare which would define WW2. Initially only the admission block was cleared to accommodate overspill from RAF Cranwell in April 1940. But by June, it was felt that a much more significant RAF hospital was needed in that area, and Rauceby was the obvious choice. So with scant notice or time for preparation, on the 20th June 1940, all patients were transferred to other institutions and almost the entire building cleared out within just 48hrs, with most going to the mental hospitals for Derby County (Pastures), Leicestershire & Rutland (Carlton Hayes) and Nottingham City (Mapperley). Only a few patients remained to occupy the former isolation hospital, in order to work on the farms and laundry, both roles at which some patients were now quite seasoned hands. New specialised operating theatres were built, and the ground floor windows were taped up and sandbagged in order to provide some protection from any bombings. RAF Rauceby, as it was now known, was to become one of the pioneering centres for plastic surgery, as air warfare meant a high prevalence of burns injuries and disfigurement to any pilots who survived. Nurses described patients who were brought in with their skin still sizzling with phosphorous, who were immediately transferred to one of three large submersion baths filled with a saline solution. The nurses who stayed to comfort them and peel away the layers of detaching skin would often get burns themselves from spending so much time in the saline environment. The main plastic surgeon at Rauceby was Squadron Leader Fenton Braithwaite, and the noted Sir Archibold McIndo also advised and practiced at Rauceby during these years. Bill Howlett, whose diverse duties included such seemingly polarised roles as “Entertainments Manager” and “Mortuary Superintendent” also had a role as photographer for the hospital, and in another pioneering move connected to RAF Rauceby’s plastic surgery expertise, new burns admissions (some being badly burned by high-altitude frostbite as well as flame) would be photographed upon admission, and then at gradual stages during the progress and aftermath of their surgery. A large and important collection of images was built up, which proved vital in the development of the process, for both military and civilian use, and was eventually incorporated into the RAF’s archives, still being used for training to this day. Rauceby’s non-psychiatric population peaked during the war, with up to 1,000 war casualties housed there, and another 1,000 beds in store should it need to be used as an all-purpose hospital in the event of invasion or heavy aerial bombardment. Psychiatric work continued to be done however, albeit for military personnel, with 1,791 out-patients seen and 141 in-patients present in 1943 alone. RAF Rauceby was very busy during this period, and 1943 records show a total of 5,337 total admissions (an average of nearly 15 per day) and 18,650 out-patient appointments (52 per day). Former staff and patients spoke of seeing ambulances lined up nose-to-tail at certain times. Two of the legendary Dambusters, Guy Gibson VC and Flt Lt Hutchinson were both admitted to RAF Rauceby; the former was rehabilitated at Rauceby but left the hospital to be killed during his next mission; the latter, who was described as “practically decapitated” on admission, in fact survived his ordeal. Another noted RAF patient was John Hannah – the youngest person to ever receive the Victoria Cross at just 18 years of age. A commemorative plaque was placed in the entrance hall to remember those R.A.F. personnel who worked and lived at RAF Rauceby between 1940-1947. Dances, balls, comedy, theatre, music and cinema films remained popular with patients, staff and locals alike while Rauceby was still an RAF hospital, and were held in the ornate recreation hall (which now doubled as a mess hall) just as they were during psychiatric use. However in 1945, after what may have been a particularly good Whitsun Monday party, someone ducked behind the stage for a furtive smoke, accidentally igniting the furniture which had been stored there, and the whole hall caught fire at around midnight, the flames propelled by the lacquered wooden flooring, pine panelling and heavy drapes covering the stage. By 3am, the hall had all but gone, and had Rauceby not been built with its own water tower and within reach of Sleaford’s fire brigade, things could have been a lot worse – but there was no loss of life that night. 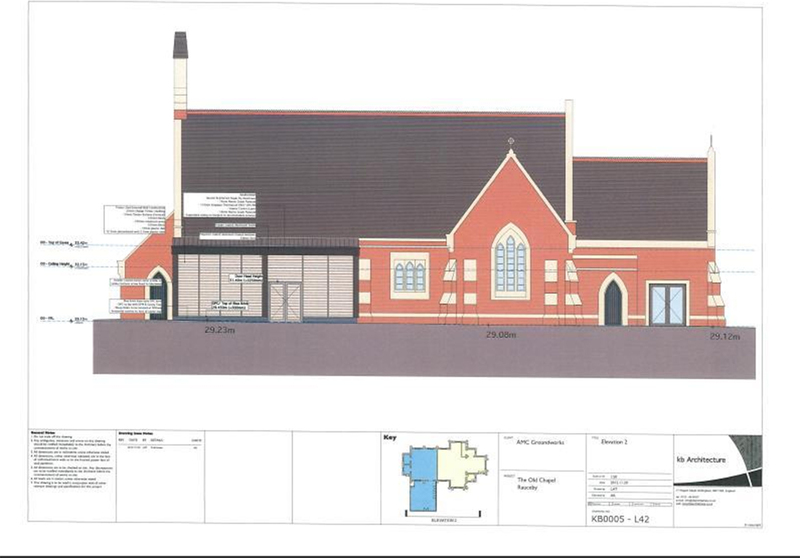 The hall would finally be rebuilt in the 1950’s with the modestly attractive Victorian style replaced with a cold, angular concrete and steel rectangle typical of 1950’s austerity. The R.A.F. remained until April 1947, and along with the various repairs and alterations that were needed to bring it back into psychiatric use, the Kesteven authorities also took the opportunity to refurbish and renovate the hospital while it was still largely empty. Patients were re-admitted from 1949 onward, by which point Rauceby, like all former County Asylums, had become a part of the newly-formed N.H.S. and was formally re-named simply “Rauceby Hospital”. Rauceby’s management moved under the jurisdiction of Lincolnshire, and its catchment area expanded to include the District of Holland and the Soke of Peterborough, whose patients had formerly been boarded out to Rauceby itself or the Northamptonshire Mental Hospital (St Crispin). This saw a catchment area that now included around 300,000 served by a mental hospital with only 609 available bed spaces. As with all former County Asylums, the 1950’s saw changes which included the introduction of new chemical sedatives to the wards, which meant that more wards were being opened up, and more freedoms allowed to patients, as well as out-patient clinics being set up in order to try to avoid so many needing to be institutionalised at all. Rauceby set up clinics in Boston, Sleaford, Grantham and Spalding. Two new nurses’ houses and a school of nursing were also built. Dr Henderson retired at the end of 1950, to be replaced by Dr Cole, the last Medical Superintendent at Rauceby. In 1953, the admissions hospital was refurbished and then re-opened as “Orchard House”, which was intended to be run largely as a separate institution to the main hospital. It provided in-patient beds, but everyone there was admitted on a purely voluntary basis, and they were free to come and go as they pleased. Unlike any major mental hospital of the time, the genders were also free to mix in a social sense at any time, and the doors were only locked at night. The patient population of Rauceby peaked at 590 in 1958. As was enforced across the country, the 1960’s saw moves from central government, spearheaded by then Health Secretary Enoch Powell, to close all the farms at the former County Asylums, ostensibly to avoid exploitation of the patients. Most of the former asylums gave up their farms reluctantly, but Dr Cole felt especially strongly that given Rauceby’s rural catchment area, it was a far more useful element of occupational therapy and training for his patients than could be claimed by most such institutions. He resisted the pressure as long as he could, but Powell would visit Rauceby in person in 1964, and some days later, Dr Cole received a letter from Powell’s Westminster office stating how appalled he was at the stench of the piggeries, and his concerns that they lay in such unhealthy proximity to the hospital buildings. They were to be closed immediately, and so the animals, bred at Rauceby for over 60 years were all sold, and the farm closed down. Although it had really only hastened the inevitable, it was later discovered that the rancid smell had in fact been caused by a blocked drain. In the notoriously hot, dry summer of 1976, the water tower, admin block and chapel all suffered subsidence, with the chapel falling out of religious use altogether, and only being used for storage since that time. A small new chapel was set up inside the main building. By the 1970’s, all British asylums were beginning to look toward eventual closure, and Rauceby was no exception, with the patient population gradually starting to dwindle throughout the decade. The former parole villa, which had taken the role of gradually reintroducing patients to the world outside the mental hospital was renamed Verbena Ward, and this became the overall direction that most of the hospital would subsequently work toward. The patients were gradually moved back into their communities, and the idea was that the care, via more local out-patient facilities, social services, self-help groups, home visitation etc., would move back there along with them. The Mental Health Act of 1983 saw this process speeded up significantly, although Rauceby was a little slower to empty than some, still having 350 patients (more than half its capacity) by 1986. By 1987 Orchard house had passed out of psychiatric use and became an administrative centre for the local Health Authority, and by 1990, nurse training was no longer happening on-site. Rauceby finally closed for good on the 17th December 1997. David Wilson Homes began “redevelopment” at the site in 2004, with a new housing estate (dubbed “Greylees”, after the railway crossing) now covering much of the grounds. The protected newts and bats which lived in and around the empty hospital buildings were relocated, and then with undignified haste, the old hospital buildings were bulldozed, with the water tower and all the central buildings going, leaving only stripped wards, the chapel, and the admin block; now shorn of its connecting corridors and standing isolated and forlorn in the middle of a huge patch of rough muddy ground where the rest of the hospital once stood. Due to the connection with William Goldring, the rear airing courts and landscaping at Rauceby was put on English Heritage’s Designed Landscapes Register, at Grade II, along with only 9 other asylums (7 of them former County Asylums), offering it some protection from being built upon. 10 years later, the remaining buildings and grounds all lie in the same sorry and gradually worsening state, with no further progress toward building or development.